John Buford Ward, age 94 of Mt. Airy, passed away on Monday, October 29, 2018. 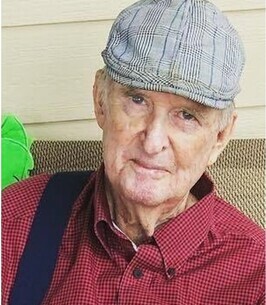 Born in Demorest, Georgia on April 22, 1924, he was the son of the late Frankie Surie Waldrip. Mr. Ward was a United States Army WWII veteran. He later retired from law enforcement, where he served as county marshal and deputy sheriff in Habersham County. Mr. Ward was a jack of all trades and could fix almost anything largely due to his inventive personality and old-time ingenuity. He was very independent and enjoyed telling jokes, singing and music. He was of the Baptist faith. In addition to his mother, he was also preceded in death by his wife, Dorothy “Dot” Henson Ward; sister, Myrtis Garrett. Surviving are his son and daughter-in-law, Terry and Melany Ward of Alto; grandchildren and spouses, Jessica (Andrew) Smith and Whit (Jessica) Ward; six great grandchildren; several nieces and nephews. Funeral services are 11 am on Wednesday, October 31, 2018, from the Chapel of McGahee-Griffin & Stewart with Dr. Kenneth Franklin and Rev. L. Wayne Hicks officiating. Interment will follow in Clarkesville City Cemetery with full military honors provided by the Grant Reeves VFW Post # 7720, the American Legion Post # 84 and the Rabun County DAV Chapter #15 as well as the United States Army Honor Guard. In lieu of flowers, donations may be made to the Georgia Sheriff’s Youth Homes, Attention: Development Division, P.O. Box 1000, Stockbridge, Georgia 30281. To plant a tree in memory of John Buford Ward, please visit our Heartfelt Sympathies Store. We encourage you to share any memorable photos or stories about John Buford. All tributes placed on and purchased through this memorial website will remain on in perpetuity for future generations.